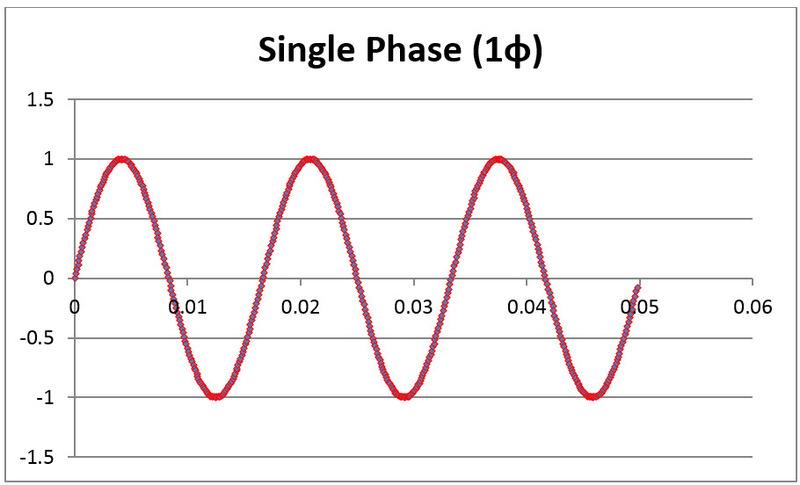 In AC electrical power systems, phase is a definition of the position of a point in time (instant) on a waveform cycle. A complete cycle is defined as 360 degrees of phase as shown below. The simplest form of electrical power is single phase, or one phase power frequency converter. This is represented by a single sine wave. Single-phase distribution is used when loads are mostly lighting and heating, with few large electric motors. In North America, individual residences and small commercial buildings with services up to about 100 KVA (417 amperes at 240 volts) will usually have three-wire single-phase distribution, often with only one customer per distribution transformer. Typically a third conductor, called ground or protective earth ground, is used as a protection against electric shock, and ordinarily only carries significant current when there is a circuit fault. Phase can also be an expression of relative displacement between or among waves having the same frequency.